Was Barack Obama's Medical Mentor, Quentin Young, an Abortionist? Retired Chicago physician Quentin Young is the father of the US "single payer" healthcare movement. 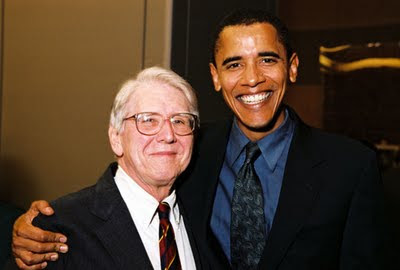 He is also the long time friend/doctor/mentor and political supporter of Barack Obama. Young, is a member of Democratic Socialists of America and a former Young Communist League activist. He was even present at the launching of Obama's political career in the Hyde Park Chicago home of former Weather Underground terrorists Bill Ayers and Bernardine Dohrn - also patients of Young's. Quentin Young has explicitly stated that he influenced Barack Obama towards "single payer" - socialized healthcare. Millions of Catholics, conservative Christians and "pro - lifers" voted for Obama, overlooking his strongly pro - abortion record in the Illinois State Senate. Abortion has become an issue in the healthcare debate. Opponents of abortion, who did, or still do support Obama, might like to know some more about the pro-abortion views of the President's mentor Quentin Young. 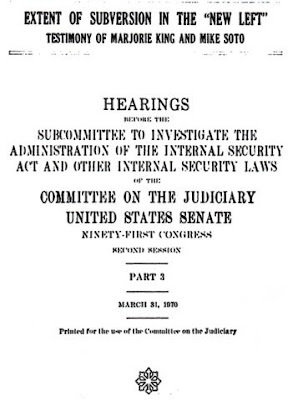 In 1970, Chicago radical activist Mike Soto gave testimony before the "Subcommittee to investigate the administration of the internal security Act..." in the aftermath of Students for a Democratic Society/Weathermen inspired student rioting in Chicago. When questioned about fellow activist Bernardine Dohrn, Soto said "I have talked to her and she is a violent maniac, because when I talked to her she said 'let's pick up arms, let's blow up this country apart until we take over'"
This testimony was given in 1970, three years before Roe vs Wade made abortion generally available in the United States. On November 10 1996 about 50 people attended a reception for "abortion providers" at Chicago's Heartland Cafe - owned by former Students for a Democratic Society leader and current Bill Ayers/Bernardine associate, Mike James - an endorser incidentally of the Progressives for Obama website. Sponsors of the event were Chicago Refuse & Resist!, the Chicago Abortion Fund, Dr. Quentin Young, Chicago NOW, Illinois NOW and DuPage County NOW, Voices for Choice from Downers Grove, Illinois NARAL, the Northwestern University Women's Center, the ACLU, the Religious Coalition for Reproductive Choice and the Women's Action Coalition. One of the speakers to honor abortion providers was Quentin Young, who has a show on NPR. He talked about the days before Roe v. Wade when he worked in the septic abortion ward at Cook County Hospital and saw hundreds of women severely maimed by back-alley butchers. The Heartland Cafe provided food and two big "thank you" cakes. I thought you were a libertarian and would therefore support a woman's right to choose?